Horses and Horse Information will be hosting a free class about horse training in the next 30 days. We will be inviting one or more horse training experts to answer your submitted questions in the live class. This teleseminar is free, and taught over the phone. There will be no sales pitch, just quality information. 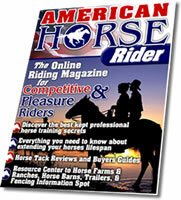 Our goal is to get more horse owners interested & informed about the best horse training techniques. Just fill in your most burning question about horse training, your name and email address to recieve an invitation to this class. P.S. Also make sure you check your email address very carefully before submitting your question about horse training along with your name. Typing mistakes may keep you from receiving your the invitation phone-in details to our free seminar. What is your biggest question about training your horse? I am a horse trainer. I am a horse owner who is looking to hire a trainer. I am a horse owner planning to train my own horse. I just have a general interest in horses and horse training. "We will never sell, barter, or rent your email address to any unauthorized third party. Period."